Beech woodland is native to Southern England and Wales (roughly, south of a line drawn from The Wash to the The Severn). 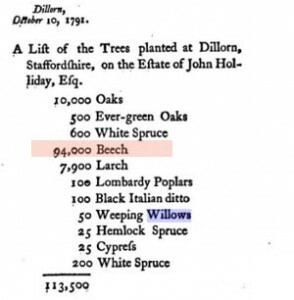 However, in some parts of the country, beech has been planted systematically, for example, John Holliday of Staffordshire planted some 94000 beech in 1791. Beech is found throughout Central and Western Europe. It is generally found on freely draining (drier) soils (chalks, limestones and light loams) such as found in the Cotswolds, Chilterns and the Downs. 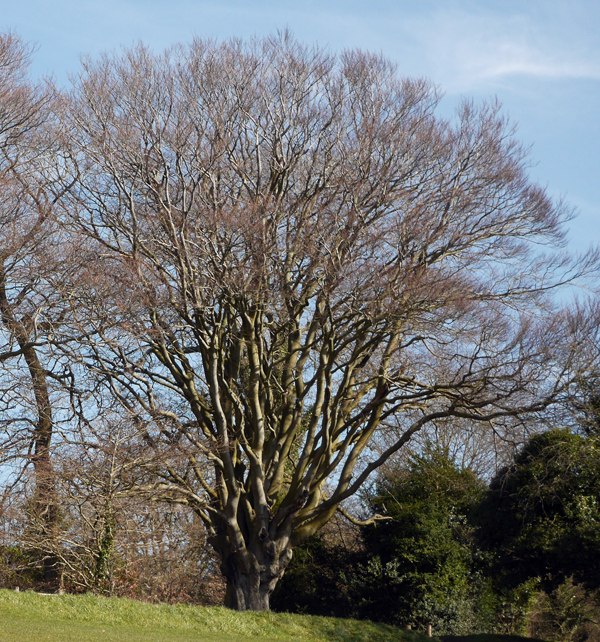 A beech tree can grow to a height of some 40+ metres, forming a dense, domed canopy. In Spring, the cigar-shaped buds burst and the young leaves are a bright ‘lime’ green edged with silky hairs. As they age, the leaves darken and the hairs are lost. 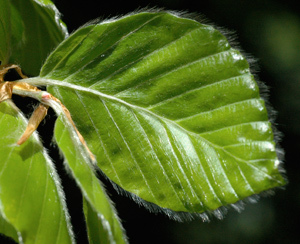 Mature leaves are between 4 and 9 cm long, with a clear leaf stalk (petiole) and a pointed leaf apex. When shed in the autumn, the leaves are relatively slow to decay. This, combined with dense canopy in the summer has a limiting effect on the ground layer / flora; beech woodland is generally quite ‘open’. Beech woodland may have s sub-canopy of yew, holly or whitebeam, and where gaps form in the canopy then species such as Ash or Sycamore may come in. The undergrowth in beech woods is not dense, dog’s mercury is quite common and species such as red helleborine and a variety of orchids (e.g. yellow bird’s nest) may be found. Beech woods often supports a rich fungal display of Boletes, Chanterelles and Agarics ,in the Autumn. 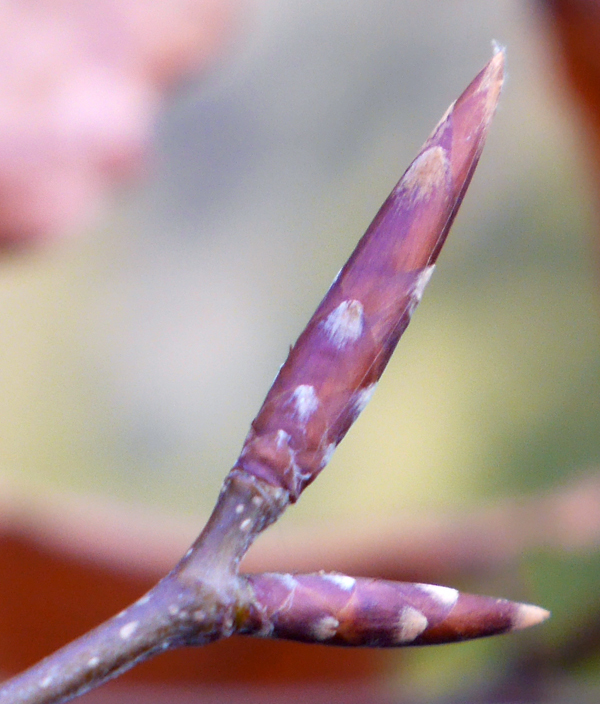 In April or May, a mature beech tree will produce flowers. The male flower take the form of catkins on long stalks, whilst the female flowers grow in pairs, surrounded by a ‘cup’. 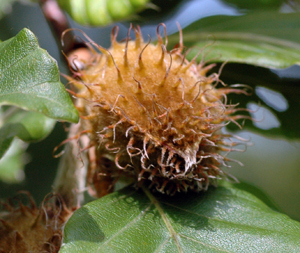 Once pollinated and fertilized, one or two beech nits (beech mast) form within the cup, and the cup becomes woody. The pollen is dispersed on the wind from the dangling catkins – so beech is anemophilous. The edible nuts or mast from the trees may be used for feeding pigs – as in the New Forest, where pigs can work their way across the forest floor removing beech nuts and acorns, (this is useful as the latter in large quantities can be toxic to the ponies). The seeds also provide food for mice, voles, squirrels and some birds. Beech woodland can yield timber that can be used as fuel – it burns well and was at one time used for the smoking of herring. It was also widely used in furniture making around the High Wycombe area. When coppiced, Beech can be extremely long lived. It is thought that after the last Ice Age that beech was relatively slow to return to the U.K. (as revealed by the pollen analysis of peat sediments) but it gradually replaced limes in woodlands where pasturage and cutting were common practice. Beech might have advanced further north but habitat destruction (loss of woodland, development of agriculture ) has probably restricted or stopped its further advance. However, it is now to be found ‘colonising’ areas where it has been introduced or taking over in areas of former hazel coppice. Beech is often grown as a hedging plant for gardens and parks. If it is regularly clipped then this ‘promotes’ marcescence; that is, leaves that persist throughout the winter providing an ‘all year round’ screen and a good habitat for garden birds. Mature Beech on Box Hill, Surrey. Can someone tell me the distance of planting small Beech about 1m tall in a Beech copse. Also if I create a woodland mix, help on plants and planting distances. Holly is generally tolerant of low light levels; beech casts a very heavy shade in summer. Holly is evergreen and is less susceptible to browsing. It can take advantage of space few other plans can occupy and is able to reproduce in these conditions. 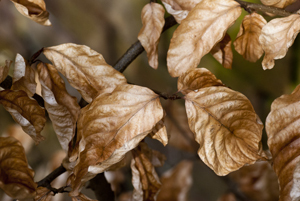 Beech is usually mixed with pedunculate oak or, less often, sessile oak, with birches, and sometimes whitebeam present in gaps and on fringes. …….. The underwood is sometimes dominated by holly, notably in woods which have been heavily grazed. …… Holly can form a dense underwood which is almost as effective as Rhododendron in eliminating ground vegetation, but it also forms dense patches of woodland on open heaths. This is an unusual formation which appears to be better developed in Britain than elsewhere. Clearance of patches of holly below mature beech and oak may be necessary to obtain regeneration of deciduous trees. Beech woodland on neutral, slightly acidic soils comprises about 45% of the habitat. It is found on heavier soils, often where the drainage is poor or impeded. Stands tend to be dominated by beech, but oak is commonly associated and bramble forms a characteristic ground layer. Although a shrub layer is often lacking, holly, and occasionally yew, can form a second layer. …….The remaining 15% of the habitat comprises acidic beech woodland (pH 3.5 – 4.5). Holly is the main understorey species and oak a common canopy associate. It is not uncommon for it to form mosaics with oak-birch-wavy-hair grass communities. I was recently walking through woodland at “Gregynog” in Mid-Wales. There was a part of the woodland that composed totally of beech trees and I noticed that there was no undergrowth except holly bushes of all stages from tiny seedlings to large trees and some beech saplings. It struck me that there must be something about both species which encourages them to grow together in a place where no other plants will grow. After viewing several web sites, I learned that some plants grow before the beech trees are in full leaf, making the most of the light available, the holly are in constant leaf but are nothing like the size of the beech trees so do not produce such a canopy. The questions are :- Is there some relationship betweeen beech and holly which encourages them to grow near each other? Why can the seeds of both these species propagate where no others can? Thank you for this post. Have a great weekend.